What the Olympus OM-D E-M5 camera offered many photographers when it was introduced during early 2012 was an elegant merging of the nostalgia of the rangefinder camera design and the latest Four Thirds technology. Many photographers mistaken it for a simple updating of the well established OM models, but soon learned that that wasn't the case, as the OM-D models were developed to be a standalone line of cameras. What photographers also discovered was that the Olympus OM-D E-M5 was an amalgamation of what Olympus had been doing right with many of its cameras. The OM-D E-M5 has plenty of weather sealing throughout the magnesium alloy body, as found in the E-5 DSLR; more features than the mirrorless, interchangeable lens E-P3; and the similarly small footprint of the OM04Ti. At 4.8” x 3.5” x 1.69” (122mm x 89mm x 43mm) and just less than a pound (425g), the OM-D E-M5 camera is as portable as any Four Thirds model, but feels like a substantial camera and fits in the hand very comfortably and securely. Not to be overlooked are the two control dials on the top of the body. First, because too many of the four-way controllers on its Four Thirds competitors were less than stellar and the dials put the control of most shooting functions where they can be easily reached when your hand is wrapped around the grip. The combination of a 16MP Four Third sensor and Olympus’ newest processor at the time, the TruePic VI, proved to give the OM-D E-M5 better dynamic range and less noise and produce excellent JPEG quality. With a highlight range of approximately 2 to 3 EV, the OM-D E-M5 outperforms the equivalent Panasonic G3 and matches many of the Sony NEX camera models of that time period. Finding a camera of this size that can capture a burst of 9 frames in RAW is an added bonus, despite the fact autofocus is static on the first frame and live view shows a previously captured image. You have the option of four slower continuous shooting frame rates (1, 2, 3 and 4), although its default setting of 3.5 fps is necessary for the image stabilization system to work. One of the reasons the Olympus OM-D E-M5 is not just a reworked version of the company’s PEN models is that its image stabilization (IS) system operates in 5 axes: vertically, horizontally and rotationally along the other 3 axes. Granted, macrophotography challenges the IS, with a higher ISO sensitivity and shutter speed needed to compensate for camera movement, but under “normal” conditions, you can shoot handheld at low shutter speeds and achieve sharp, clear images. 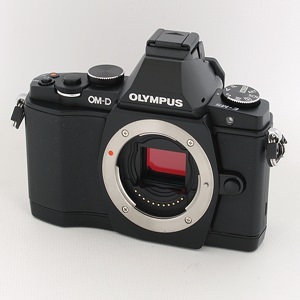 The video system of the OM-D E-M5 was certainly a feature about which Olympus could boast, as it changed the file types from AVCHD to H.264 MOV. The camera’s 1080i/60 video capture includes two compression choices: 20Mbps fine quality creates approximately a 22-minute segment or 17Mbps normal, allowing for 29 minutes of video. The improved image stabilization does an excellent job of eliminating virtually all hand shaking from the video image when shooting with one hand and renders smooth movement while the subject is walking. Other specifics that many camera reviewers like at the time the OM-D E-M5 hit the market was its highly customizable capability, although you must spend a bit of time learning the menu system; a very large selection of compatible and affordable lenses; and an image quality that will satisfy the great majority of photographers. Olympus has a long and storied history, so every camera they've designed and manufactured is as solid and dependable as any other companies’. That’s why a refurbished, used OM-D E-M5 is such a smart choice. You’ll save money and receive a 14-day, no-questions-asked return policy and a 6-month, non-transferable warranty when you buy it from KEH, the world’s largest dealer of used cameras and photographic equipment. You’ll find the Olympus OM-D E-M5 and the many lenses that it will accept when you visit the KEH Website at KEH.com – and, more importantly, people who are photographers just like you are always ready to help because they want you to enjoy the photography experience to the max.